"Ahoy! All seafood lovers will really enjoy this hearty feast. Garnish with fresh parsley." Place saffron threads in a small bowl, and cover with 1 tablespoon boiling water. Set aside. Scrub mussels clean in several changes of fresh water and pull off beards. Discard any mussels that are cracked or do not close tightly when tapped. Put mussels into a saucepan with wine and water. Cover and cook over high heat, shaking pan frequently, 6-7 minutes or until shells open. Remove mussels, discarding any which remain closed. Strain liquid through a fine sieve and reserve. Heat butter and oil in a saucepan. Add onion, garlic, leek and fenugreek and cook gently 5 minutes. Stir in flour and cook 1 minute. Add saffron mixture, 2-1/2 cups of reserved cooking liquid and chicken broth. Bring to a boil, cover and simmer gently for 15 minutes. Meanwhile, keep 8 mussels in shells and remove remaining mussels from shells. 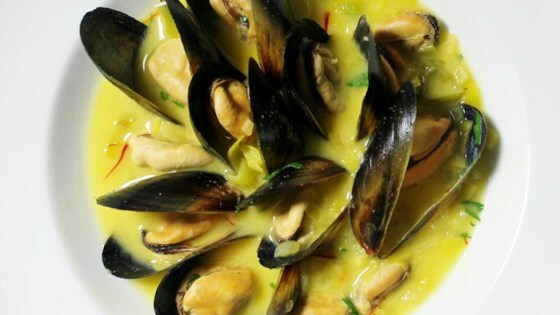 Add all mussels to soup and stir in chopped parsley, salt, pepper and cream. Heat through 2-3 minutes. Garnish with parsley sprigs, if desired, and serve hot. Nice easy soup to make with lots of flavour. Will make again.